I tend to gravitate towards all things unique, innovative and cleverly designed, so instantly fell madly in love with this watch. 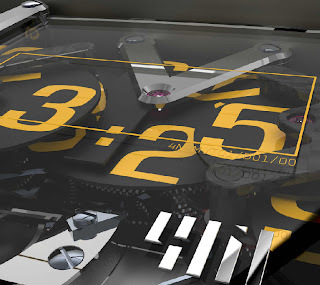 The 4N's face gives the look of visually scattered numbers, but it is strategically designed with three rotating gears that collaboratively provide a cohesive set of digits displaying the time. The site describes: "It is based on a clever configuration of discs rotating in discontinuous mode. 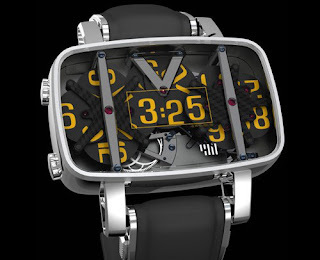 Three disc sub-assemblies, made of aluminum or titanium alloys are held in carbon cage structures, are activated to reveal the time on a display which changes as each minute passes. (4 discs for the hour, 5 for the minutes and 1 for the tens of minutes). The mechanism uses a constant force jump system which guarantees minimum energy consumption, regardless of the winding tension." The hint of color, modern design and ruggedly chic'ness of this watch just has me along with many others drooling. Unfortunately only 16 will be made.